A new report that former campaign chairman Paul Manafort was wiretapped under secret court order could bolster President Trump’s explosive March claim about surveillance under the previous administration, after months of media mockery. The CNN report said the surveillance of Manafort continued into early 2017, covering the period before and after the November presidential election. This reportedly covered a stretch when Manafort was known to talk to Trump, though it’s unclear whether Trump’s discussions were ever picked up. Also unclear is where the wiretapping occurred. Manafort has a residence in Trump Tower, as well as a home in Alexandria, Va. 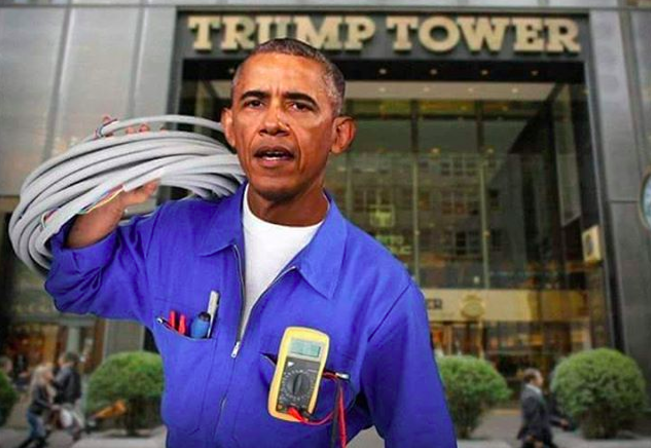 But the report has forced the media to give a second look at Trump’s widely derided claims this past March that former President Barack Obama had his “wires tapped” at Trump Tower. The hashtag “TrumpVindicated” was taking off on Twitter Tuesday morning. Andrew Napolitano, Fox News senior judicial analyst, said the latest report is “absolutely consistent” with allegations made by Trump and others. And WikiLeaks’ Julian Assange took a jab at CNN for slamming the president’s surveillance claims earlier this year. Trump, in a seemingly puzzling tweetstorm at the time, said in March that Obama had his wires tapped before the election. An Obama spokesman at the time adamantly denied that Obama or any White House official ordered such surveillance. The latest report does not indicate Obama was involved. It also does not make clear whether Trump himself was tapped or whether Trump Tower was wired, but leaves open the possibility. Many questions remain unanswered. The Justice Department itself, in a recent court filing, said the DOJ and FBI did not have evidence of any Trump Tower surveillance during the election. At the least, the latest report shows a close member of his inner circle was surveilled. The wiretapping was authorized by a secret Foreign Intelligence Surveillance Act (FISA) court after the FBI started to investigate Manafort in 2014, CNN reported. He's been under scrutiny over his financial dealings and lobbying efforts with pro-Russia and Ukrainian officials but has denied colluding with Russia to influence the election. The order to monitor Manafort was discontinued in 2016, but investigators obtained another FISA warrant that stretched into early 2017, according to the report. Some of the intelligence collected during the surveillance reportedly signaled that Manafort may have pushed for Russian officials to help try to get then-candidate Donald Trump elected. However, sources told CNN the evidence was not conclusive. Manafort, according to the report, was not surveilled during the June 2016 Trump Tower meeting in which Donald Trump Jr., Jared Kushner and Manafort met with Kremlin-linked attorney Natalia Veselnitskaya. Manafort – who is a key figure in Special Counsel Robert Mueller’s investigation into Russia’s involvement with the election – had his Virginia home raided in July by FBI agents who were looking for financial documents related to the election. The raid was followed up with a warning to Manafort from Mueller’s prosecutors that they planned to indict him, The New York Times reported. Manafort, a longtime GOP operative who worked for former Presidents Ronald Reagan and George H. W. Bush, stepped down as the Trump campaign’s chairman in August 2016 amid mounting speculation surrounding his ties to Ukrainian politics. If the CNN report is confirmed, Manafort would be the second person affiliated with the Trump campaign known to be monitored under a FISA warrant, behind former campaign adviser Carter Page. Manafort, who registered as a foreign agent this summer, has said his work in Ukraine was not related to the 2016 campaign.